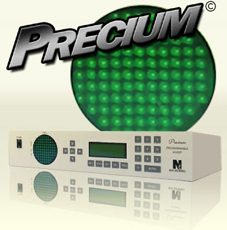 Precium is a user-programmable electron-beam gun sweep. Instead of using manufacturer-determined sweep patterns, Precium allows end users to program, store, modify, and run individual sweep patterns to compensate for variabilities in individual electron beam guns. Each pattern is composed of “steps”; each step defines the X-Y coordinate of electron beam gun target and the duration, or the “dwelling” time. Users may program up to 100 steps for each pattern. Users may also define the maximum ranges for the X and Y coordinates to compensate for variations of the individual electron beam guns. Precium also contains a RS-232 serial port to connect to an IBM compatible PC running Windows 98 or 2000. This allows transferring of user-programmed patterns between a PC and a Precium for greater flexibility in storing, designing, and automation. A sweep pattern can now be designed on a PC and transferred to one or more Preciums for better automation. Or, a sweep pattern can be experimented on one Precium, downloaded and fine-tuned on a PC, and re-uploaded to the original or other Preciums for higher productivity. Precium’s interface with PC also allows sweep patterns to be stored on disks for future references.